My vision has always been good, but for the last 10 years I've been using cheap reading magnifiers to help me see fine print. I had a shocking wake up call when I forgot to take my reading glasses to church on Sunday and realized it was not just fine print I needed them for. I could not read anything without my glasses. 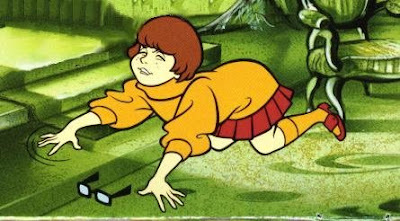 I felt as blind as Velma from Scooby Doo when she'd drop her glasses and could not see them right in front of her. My already impaired hearing in my right ear has also gotten worse over the last couple years. I also find myself getting tired earlier and earlier in the evening. I hit a certain point at night when I realize I'm finished and have about 2 minutes remaining to brush my teeth before I literally lie down and fall asleep for the night. It's like an aura that hits someone before a seizure. I get this feeling that I'd better be ready to sleep in a few minutes because my energy is gone. It's the same kind of panic and urgency you feel when you see you have a 1% charge remaining on your cell phone. 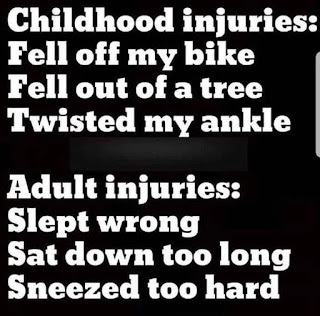 Another feature of aging is that I am more prone to injuries now and they take longer to heal. I no longer have cool stories to tell about why I am limping but now have to give embarrassing answers like "I hurt myself taking clothes out of the dryer." 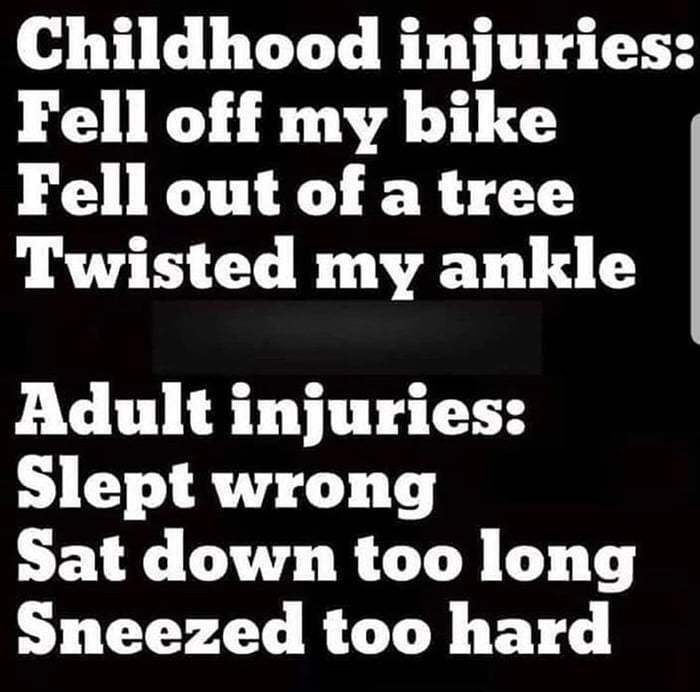 I also experience odd phantom injuries in my hip and shoulders that come and go. Some days I am fine and others I can hardly walk up stairs. I've been complaining about getting old on this blog for over 10 years. I just reviewed some of my older posts about this topic and I have to laugh since I would love to be in the shape I was in my 40's when I was whining about how hard getting old is. Sometimes I feel like aging gracefully requires a personal chef, trainer, masseuse, hormone replacement therapy, and a special effects budget. I've already experienced many mid-life crises over the years so I'm not sure if I need to find a different name for what I'm feeling. Some days I get a little frustrated or depressed with a body that doesn't perform like it used to but I'm not going to give up. In fact, I have a chip on my shoulder about getting old. Years ago I set a goal to be able to dunk a basketball when I was 50. I'm now 50 and it's been a couple years since I dunked so I guess I need to start working on that goal soon if I'm going to make that happen. My body may be working slower than it used to, but on the bright side, my nose and ear hair is growing faster than ever before. Last year I went back to America around Christmas time and ended up missing much of the dry season in Ghana. This year I'm learning what it's like. 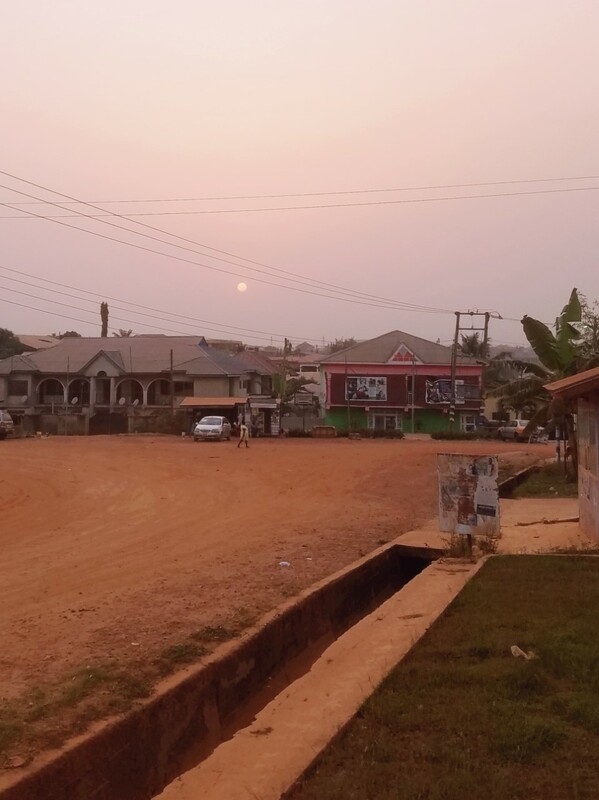 Between November and March, West Africa experiences the "Harmattan" which is the dry season. It is a result of the winds from northern Africa blowing sand from the Sahara desert down to the coast of west Africa. When I first heard that explanation I thought someone was just making up the reason for the dusty air but it's not just a wives' tale. Trade winds from the Sahara do actually blow dust and sand all the way down here. During this time of year it stops raining and the air is more hazy and dryer than usual. In the last two months I've only see it rain twice and there is not substantial rain in the forecast for several months. Lately I've noticed you can look directly at the red sunsets in the evening since there is so much debris in the air. There is a fine layer of red dust that settles on everything on a daily basis. I'm even shocked at how fast it can accumulate in some of the rooms where we have air conditioning and closed windows. I have not been running in this weather and don't intend to start strenuous exercise outside until we get some rainfall. Once the rains start again the humidity will soar but I'd still prefer that to having everything covered in dust. 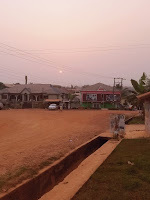 I found the following clip on Youtube that shows how the drastic contrast in the weather that happens during Harmattan. I miss the rain and am looking forward to things greening up again in several months.